An app used for reporting King Tides can also be used to report marine debris along the shoreline. Check out the news release issued today by the Washington Department of Natural Resources. Higher-than-predicted marine waters, brought about in part by recent weather conditions, have given us unexpected “King Tides” in many areas of Puget Sound. I noticed that the waters of Hood Canal seemed exceedingly high this afternoon, as I drove along Seabeck Highway where the road hugs the shoreline. The waters were not supposed to be this high, according to tide tables developed by the National Oceanic and Atmospheric Administration, so I checked some actual levels recorded at nearby locations. High-water levels measured on the waterfronts in Seattle, Tacoma and Port Townsend were nearly 1½ feet higher than what had been predicted by NOAA for those areas. For example, in Seattle the preliminary high-water level was listed at a tidal elevation of 12.98 feet at 12:54 p.m. today, compared to a predicted high tide of 11.56 feet. This is the season for King Tides, a name given to the highest tides of the year. High tides, mostly generated by the alignment of the sun and the moon, are predicted for Christmas Eve, rising higher to the day after Christmas and then declining. But, as we’ve seen this week, as well as on Thanksgiving Day, predicted high tides can be dramatically boosted by heavy rains, low atmospheric pressure and onshore winds. As one can see by looking at observed and predicted tidal levels in Seattle, the actual tidal level has exceeded the predicted level more often than not over the past 30 days — and lately it has been higher by quite a lot (shown in chart at bottom of this page). Actual levels are measured in real time in only 14 places in Washington state. One can access the charts from NOAA’s Water Levels — Stations Selections page. Washington Sea Grant has posted a list of dates when high tides are expected in various areas, called King Tides Calendar. Sharing photos of high tides hitting the shoreline is part of the adventure, so sign up for MyCoast to share your pictures or view images posted by others, or download the cellphone app to make the connection even easier. 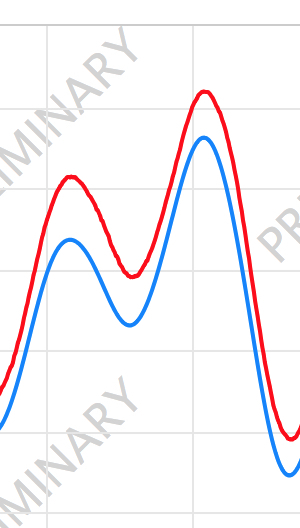 The chart shows the actual tidal water levels in Seattle (red) compared to the predicted levels (blue). Click to go to NOAA’s website. 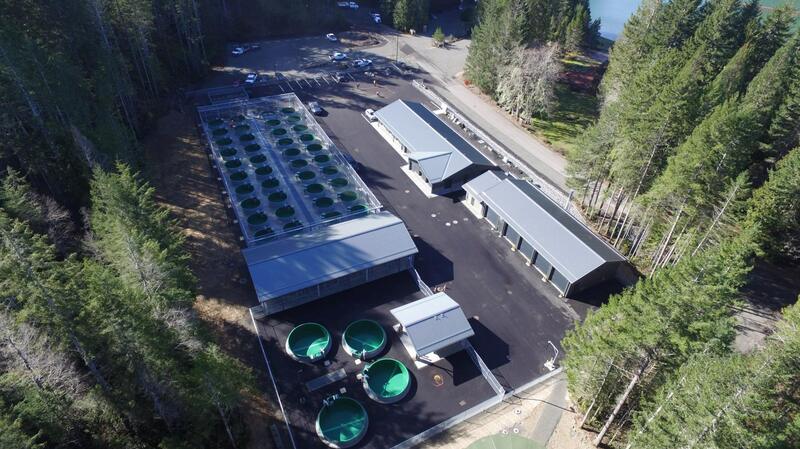 These bright, torpedo-shaped hatchery fish are the first of what is expected to become an ongoing run of spring Chinook as part of a major salmon-restoration effort related to the Cushman Hydro Project. Eventually, the salmon run could provide fishing opportunities for humans and orcas. Andrew Ollenburg, Cushman fish facilities manager for Tacoma Public Utilities, reported that 19 spring Chinook — 15 females and four males — have been captured at the base of the lower Cushman Dam on the North Fork of the Skokomish River. As of this week, biologists estimated that 50 or 60 spring Chinook were in the river farther below the dam — and more are coming. Hood Canal has changed colors again, shifting to shades of bimini green, as it did in 2016, when satellite photos showed the canal standing out starkly among all other waters in the Northwest. Hood Canal has changed colors as a result of a plankton bloom, as shown in this aerial photo taken in Northern Hood Canal. The color change is caused by a bloom of a specific type of plankton called a coccolithophore, which shows up in nutrient-poor waters. The single-celled organism produces shells made of calcite, which reflect light to produce the unusual color. Observers are now waiting for the clouds to depart, so we can get new satellite images of the green waters. The plankton bloom started June 1 in Quilcene and Dabob bays, according to Teri King of Washington Sea Grant. It came about a week earlier than last year and has since spread through Hood Canal. Observers in the Seabeck area reported seeing the bloom the past few days. The bimini green color, which gets its name from an island in the Bahamas, is especially noticeable when the sun comes out. Jellyfish are largely missing this fall from Puget Sound. Some patches of red-brown algae, such as this one in Sinclair Inlet, have been observed. At least temporarily, something has changed in the waters of Puget Sound over the past few months. It may not last, but it appears to be a good thing. The monthly EOPS report, compiled by a team of state environmental experts, lays out recent water-quality data for the Department of Ecology. The report also includes personal observations, aerial photographs and scientific interpretations that keep readers abreast of recent conditions while putting things in historical context. 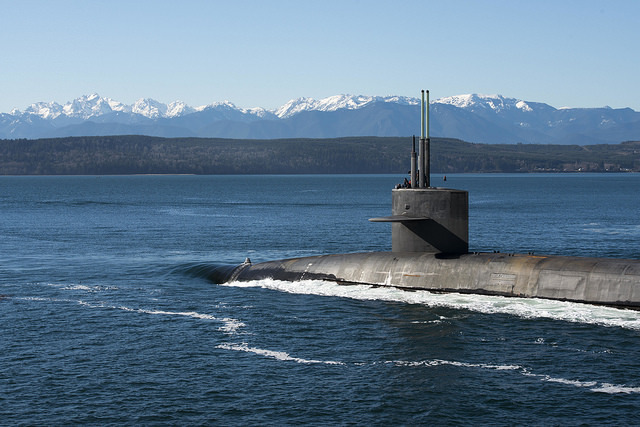 The “fresh” conditions called out in the report refers to the salinity of Puget Sound, which is driven largely by the freshwater streams flowing into the waterway. The reference to 17 years is a recognition that the overall salinity hasn’t been this low since the current program started 17 years ago. Dissolved oxygen, essential to animals throughout the food web, was higher this fall than we’ve seen in some time. Hood Canal, which I’ve watched closely for years, didn’t come close to the conditions that have led to massive fish kills in the past. 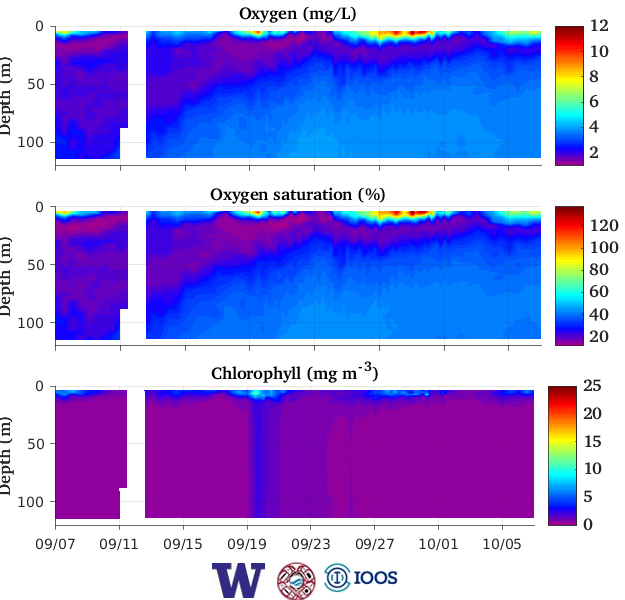 The only problem areas for low oxygen were in South Puget Sound. Water temperatures in the Sound, which had been warmer than normal through 2015 and 2016, returned to more average conditions in 2017. Those temperatures were related, in part, to the warm ocean conditions off the coast, often referred to as “the blob.” In South Puget Sound, waters remained warm into October. Why is the water fresher this fall than it has been in a long time? The reason can be attributed to the massive snowpack accumulated last winter, according to oceanographer Christopher Krembs, who leads the EOPS analysis. That snowpack provided freshwater this past spring, although rivers slowed significantly during the dry summer and continued into September. “We had a really good snowpack with much more freshwater flowing in,” Christopher told me, adding that the Fraser River in southern British Columbia was well above average in July before the flows dropped off rapidly. The Fraser River feeds a lot of freshwater into northern Puget Sound. Freshwater, which is less dense than seawater, creates a surface layer as it comes into Puget Sound and floats on top of the older, saltier water. The freshwater input fuels the circulation by generally pushing out toward the ocean, while the heavier saltwater generally moves farther into Puget Sound. “The big gorilla is the upwelling system,” Christopher noted, referring to the rate at which deep, nutrient-rich and low-oxygen waters are churned up along the coast and distributed into the Puget Sound via the Strait of Juan de Fuca. Lately, that system has been turned down to low as a result of larger forces in the ocean. With a favorable snowpack already accumulating in the mountains, experts can’t help but wonder if we might repeat this year’s conditions in Puget Sound over the next year. 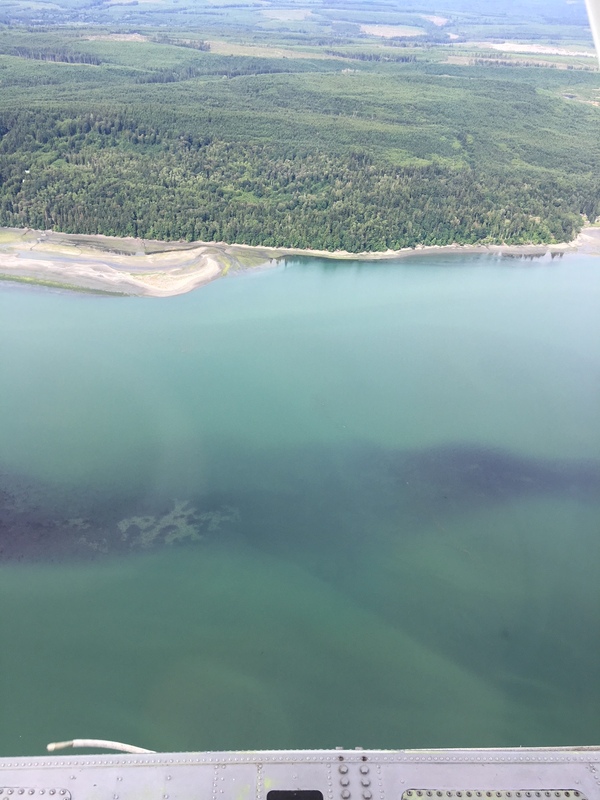 Christopher told me that during aerial flights this fall, he has observed fewer jellyfish and blooms of Noctiluca (a plankton known to turn the waters orange) than during the past two years. Most people think this is a good thing, since these organisms prevail in poor conditions. Such species also have a reputation as a “dead end” in the food web, since they are eaten by very few animals. Christopher said he noticed a lot of “bait balls,” which are large schools of small fish that can feed salmon, birds and a variety of creatures. “I assume most of them are anchovies,” he said of the schooling fish. I would trade a jellyfish to get an anchovy on any day of the year. A trick question: Can you locate Anderson Creek? 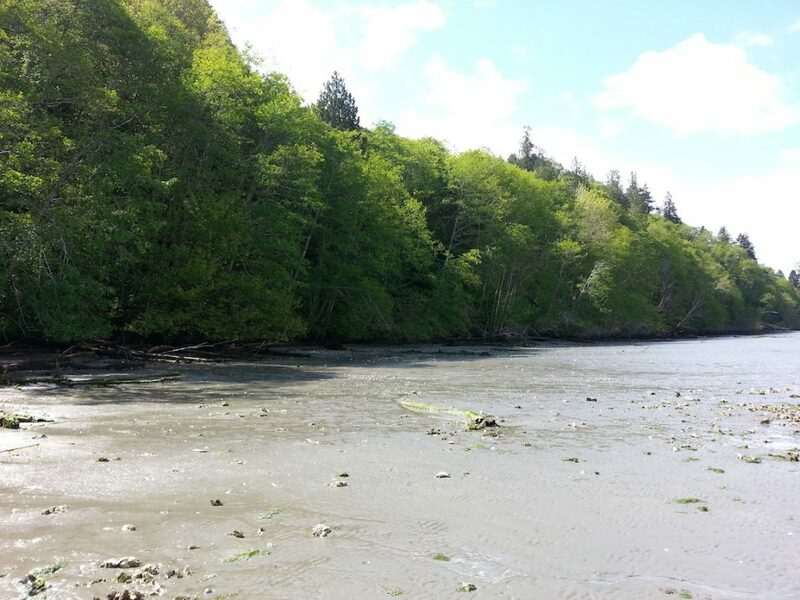 Let’s talk about Anderson Creek in Kitsap County. Where exactly is that stream? If you were to say that Anderson Creek is a stream that spills into Hood Canal near Holly, you would be right. 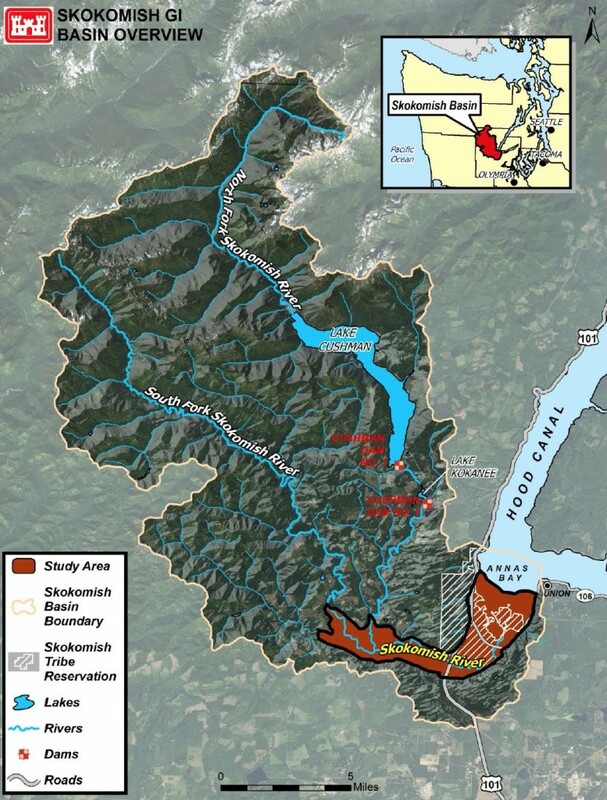 If you are thinking of another Hood Canal stream — the one that you cross north of Seabeck while traveling on Anderson Hill Road — that would be right, too. And nobody could complain if you believe that Anderson Creek is the name of the stream that flows into Sinclair Inlet near Gorst. Officially, they are all Anderson Creek, according to the Geographic Names Information System, the official database of true names. GNIS is maintained by the U.S. Geological Survey. I discovered the existence of three Anderson Creeks in Kitsap County as I sat down to blog about a new bridge project being planned on Seabeck-Holly Road north of Holly — over a stream I have always called Big Anderson Creek. I immediately thought that someone in Public Works must have accidentally shortened the name from Big Anderson Creek to Anderson Creek, but I guess I was wrong. I mean, doesn’t everyone call it Big Anderson Creek? And, last but not least, Big Anderson Creek is the name used by Kitsap County Public Works in its stream-monitoring program. Little Anderson Creek, the one farther north, is in the same boat as Big Anderson Creek. A lot of people use the descriptive “Big” and “Little” when talking about the two streams, but officially they are wrong, according to my assessment. Ed Smith, Public Works project manager for the bridge construction, told me that he will keep calling it “Anderson Creek.” That’s the official name on the maps that he uses. 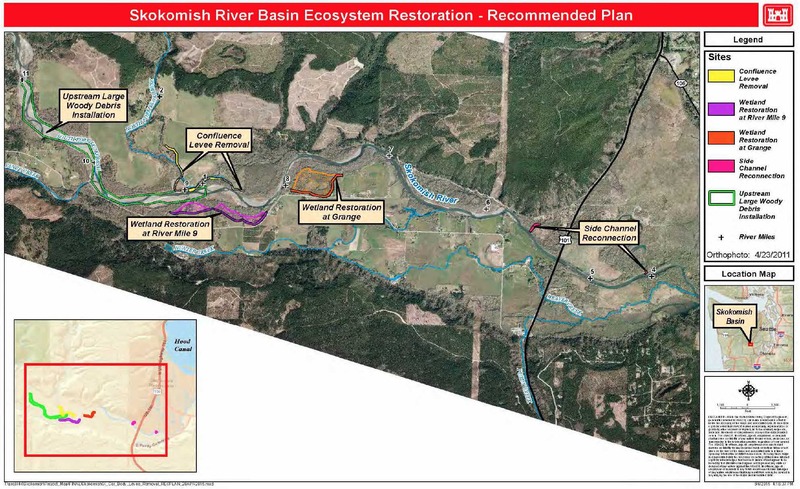 It is also the name listed on the “hydraulic project approval” issued by the Washington Department of Fish and Wildlife to authorize construction. Through the years, I’ve written quite a lot about confusing and conflicting names, but I never had a clue about the discrepancy involving Big and Little Anderson creeks. If someone reading this has the time and dedication to officially change the names of these two streams, I don’t think anyone would object. The process begins with an application to the Washington State Committee on Geographic Names. The committee’s coordinator, Caleb Maki, can help people work their way through the process. Please let me know if you tackle this project. Meanwhile, I will continue using the popular nomenclature of Big and Little Anderson creeks. 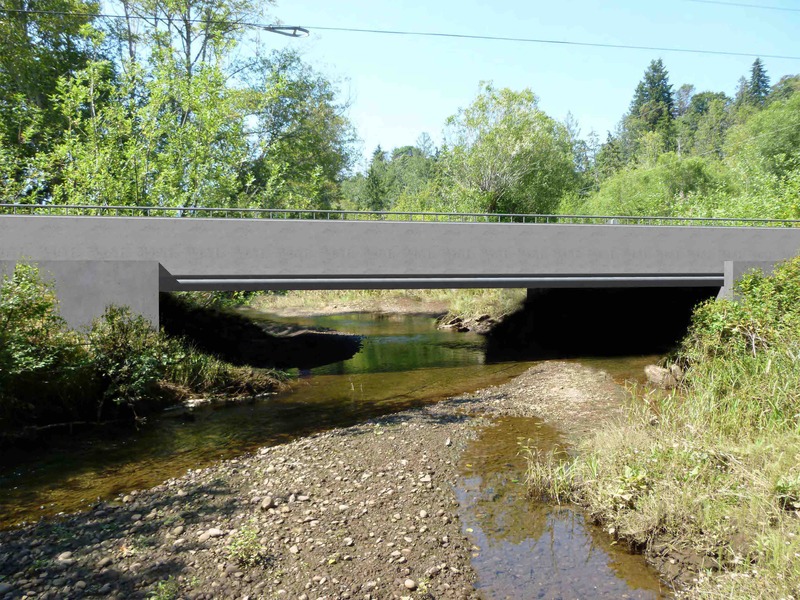 As for the new bridge over Big Anderson Creek, a 50-foot concrete structure will replace the aging 29-foot timber bridge built in 1950. The opening for the stream will increase from about 28 feet to about 45 feet, Smith said. That will give the stream slightly more room to shift around during heavy flows. Work will begin July 18 and wrap up around December, according to the schedule. Seabeck-Holly Road, the main route to and from Holly, will be reduced to one lane during the construction. 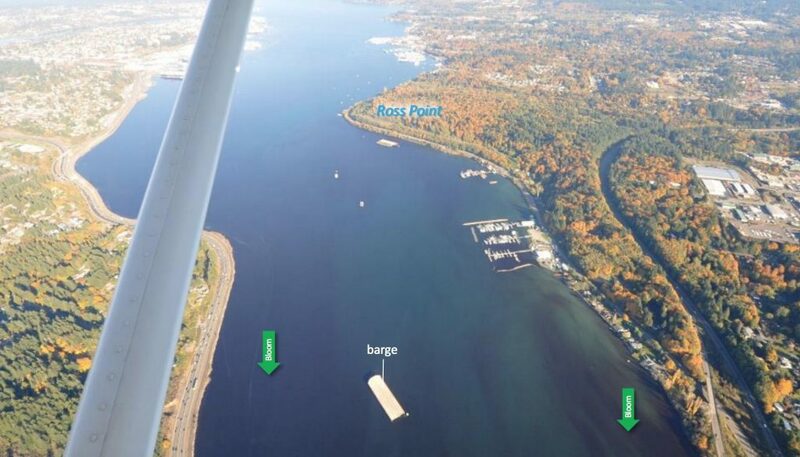 Hood Canal Coordinating Council has finally found some shoreline property to compensate for environmental damage from the Navy’s $448-million Explosives Handling Wharf at Bangor. 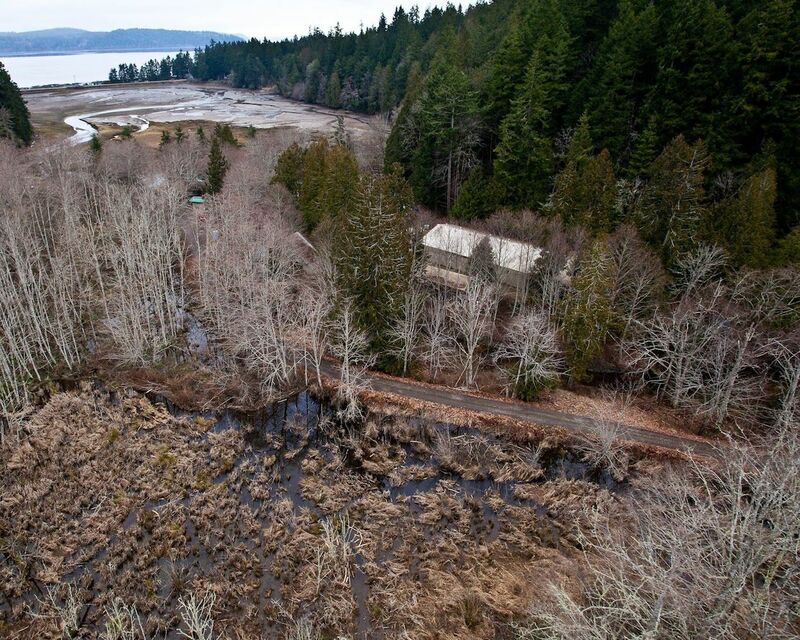 The 6.7 acres of waterfront property — located near Kitsap County’s Anderson Landing Preserve on Hood Canal — becomes the first saltwater mitigation site in Washington state under an in-lieu-fee mitigation program. The $275,000 purchase was approved Wednesday by the coordinating council, which manages the in-lieu-fee program. The Navy itself is not a party to the transaction, having paid the coordinating council $6.9 million to handle all the freshwater and saltwater mitigation required for the wharf project — including managing the mitigation properties in perpetuity. The coordinating council’s in-lieu-fee program, which is overseen by state and federal agencies, allows developers to pay a flat fee for their environmental damage instead of undertaking mitigation work themselves. In a new game open to everyone, 48 colorful cartoon fish will soon follow the wandering paths of real-life steelhead that have been tracked during their migration through Puget Sound. Just like their counterparts in the real world, some of the young steelhead in the game will survive the trip from South Puget Sound or southern Hood Canal — but many will not. The game’s basic tenet is to choose a fish that you feel will be lucky or cunning enough to make it through a gauntlet of hazards from predators to disease. You then watch and learn about the needs and threats to salmon and steelhead as the game progresses over 12 days, beginning May 8.